Soak onion rings in a bowl of ice water for 1 hour; drain. Combine flour and seasonings in a large plastic bag; pour buttermilk into a shallow dish. 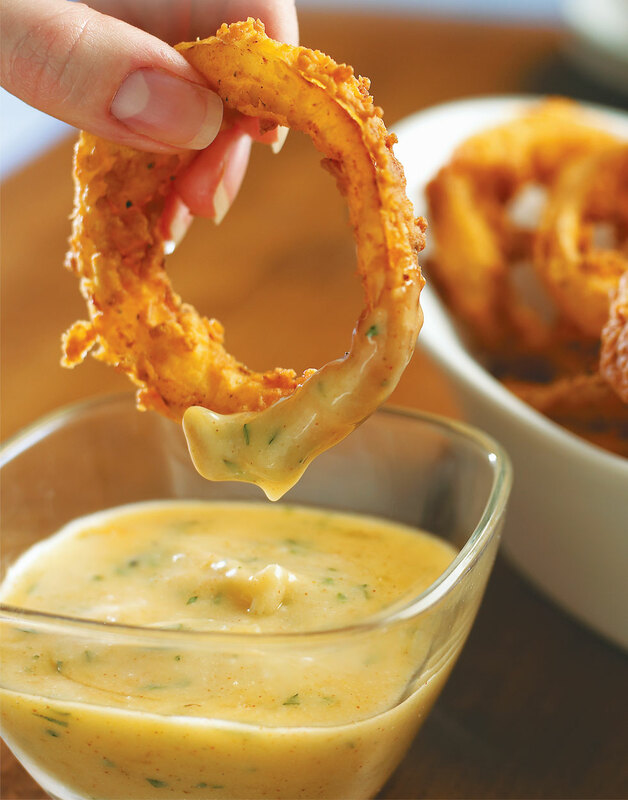 Dip onion rings in the buttermilk, then transfer a few at a time to the flour using a skewer for easy maneuvering. Dip rings a second time into the buttermilk and flour using the skewers. Set the coated, skewered rings over a bowl while coating the remaining onions. Heat oil in a pot over medium-high to 365°. Fry half the onions in the oil until golden, 3–4 minutes. Remove from the oil using skewers, then rest over a bowl to drain. Fry remaining onions in the same way. Double-dip rings in buttermilk and flour mixture — it produces a crispier crust and great flavor. Lay skewers with onion rings over a bowl to drip while you dip the rest of the onions. Use a skewer to add and remove rings from oil. Drain fried onion rings on a paper-towel-lined plate.